Let’s think about what it means to be a solution to a linear equation with two variables in it. Which figure has the largest shaded region? At the corner produce market, apples cost \$1 each and oranges cost \$2 each. Noah has \$10 to spend at the produce market. Can he buy 7 apples and 2 oranges? Explain or show your reasoning. What combinations of apples and oranges can Noah buy if he spends all of his \$10? Use two variables to write an equation that represents \$10-combinations of apples and oranges. Be sure to say what each variable means. What are 3 combinations of apples and oranges that make your equation true? What are three combinations of apples and oranges that make it false? Graph the equation you wrote relating the number of apples and the number of oranges. What is the slope of the graph? What is the meaning of the slope in terms of the context? Suppose Noah has \$20 to spend. Graph the equation describing this situation. What do you notice about the relationship between this graph and the earlier one? You have two numbers. If you double the first number and add it to the second number, the sum is 10. Let $x$ represent the first number and let $y$ represent the second number. Write an equation showing the relationship between $x$, $y$, and 10. Draw and label a set of $x$- and $y$-axes. 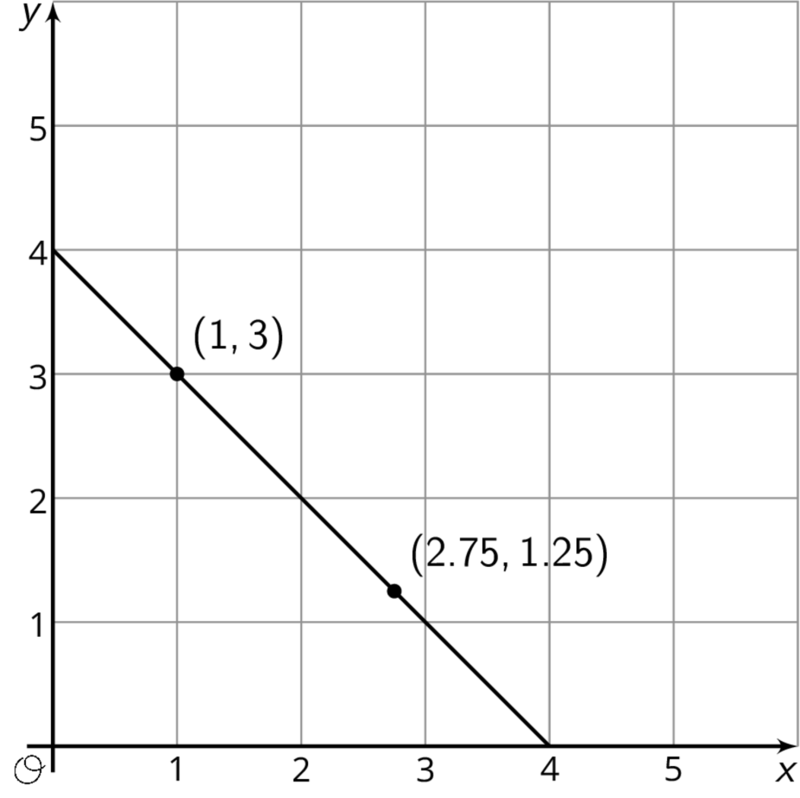 Plot at least five points on this coordinate plane that make the statement and your equation true. What do you notice about the points you have plotted? List ten points that do not make the statement true. Using a different color, plot each point in the same coordinate plane. What do you notice about these points compared to your first set of points? Think of all the rectangles whose perimeters are 8 units. If $x$ represents the width and $y$ represents the length, then $$2x+2y=8$$ expresses the relationship between the width and length for all such rectangles. For example, the width and length could be 1 and 3, since $2 \boldcdot 1 + 2 \boldcdot 3 = 8$ or the width and length could be 2.75 and 1.25, since $2 \boldcdot (2.75) + 2 \boldcdot (1.25) = 8$. We could find many other possible pairs of width and length, $(x,y)$, that make the equation true—that is, pairs $(x,y)$ that when substituted into the equation make the left side and the right side equal. A solution to an equation with two variables is any pair of values $(x,y)$ that make the equation true. We can think of the pairs of numbers that are solutions of an equation as points on the coordinate plane. Here is a line created by all the points $(x,y)$ that are solutions to $2x+2y=8$. Every point on the line represents a rectangle whose perimeter is 8 units. All points not on the line are not solutions to $2x+2y=8$. A solution to an equation with two variables is any pair $(x,y)$ that can be used in place of the variables to make the equation true.